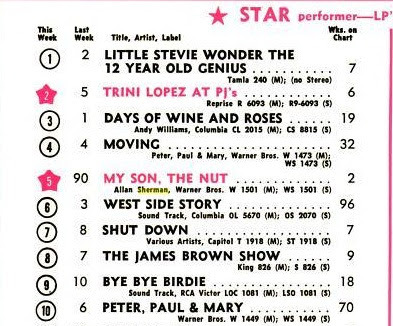 Sherman's My Son, The Nut album zooms to the top in just two weeks on the charts. A week later on Aug. 24, 1963, it was at #5. Guess where it went on Aug. 31? Have you ever considered publishing an e-book or guest authoring on other websites? I have a blog based on the same subjects you discuss and would really like to have you share some stories/information. I know my readers would value your work. If you are even remotely interested, feel free to shoot me an e mail.